Classical music refers to a style of music based in the European tradition of music, both secular and liturgical. The term has come to characterize music that is viewed as an art form rather than as entertainment or serving some other subsidiary function. As with most Western music, classical music is generally in written form, using staff notation, such that the performance (i.e., pitch, speed and meter) of a piece is a literal interpretation, and improvisation or embellishment by the artist is limited. Other qualities attributed to classical music include the use of a variety of orchestral instruments (e.g., piano, violin, clarinet), the use of intricate form and composition, agn advanced technical proficiency in its artistic performance and exclusivity in taste and appeal. Classical music is often described in terms of the historic period of its composition with the Medieval (6th through 15th centuries) and Renaissance (15th through 17th centuries) periods describing the Early Era, and the Baroque (1600�C1750), Classical (1750�C1830) and Romantic (1815�C1910) eras delineating the Common Practice Period. There is also a modern (20th century) and a contemporary period (mid-1970s to the present). The Medieval period of classical music began with the fall of Rome and continued through the Middle Ages to the Renaissance. During this period, music was greatly appreciated as an art form, with Saint Thomas Aquinas extolling it as an art and a science. Medieval classical music featured Gregorian chant, a homophonous melody without accompaniment or time measure, and gradually developed into polyphony, or plainchant melodies or motets featuring harmonic counterpoint. In the Renaissance period, there was an overall greater expression of the human consciousness as well as elements of nature. A greater use of instruments (e.g., flute, harp, lute, trumpet and shawm, a progenitor of the oboe) expanded to include lower-pitched instruments (e.g., the dulcian, the progenitor of the modern-day bassoon). Stringed keyboard instruments such as the clavichord and harpsichord were also popularized. The Early Period was followed by what is known as the Common Practice Period, which includes the Baroque, Classical and Romantic periods. Baroque music (from the French word baroque meaning "irregular," in turn deriving from the Portuguese word barroco or "imperfect pearl") is characterized by a basso continuo (thorough bass), and a complex, melodic counterpoint. It is often associated with a negative connotation as elaborate or embellished, with melodies often interjected with sometimes excessive mordants, appoggiaturas and chromatic scales. Some Baroque composers of note include Antonio Vivaldi, George Frideric Handel and Johann Sebastian Bach. The Classical era that followed is normative of what is considered the body of classical music. A new vigor in musical style erupted from the continued decline of opera, growing boredom with the polyphonic style, increased combinations of and proficiency in instruments and increased experimentation with melodies and harmonies. It was during this time that the piano became the primary keyboard instrument. 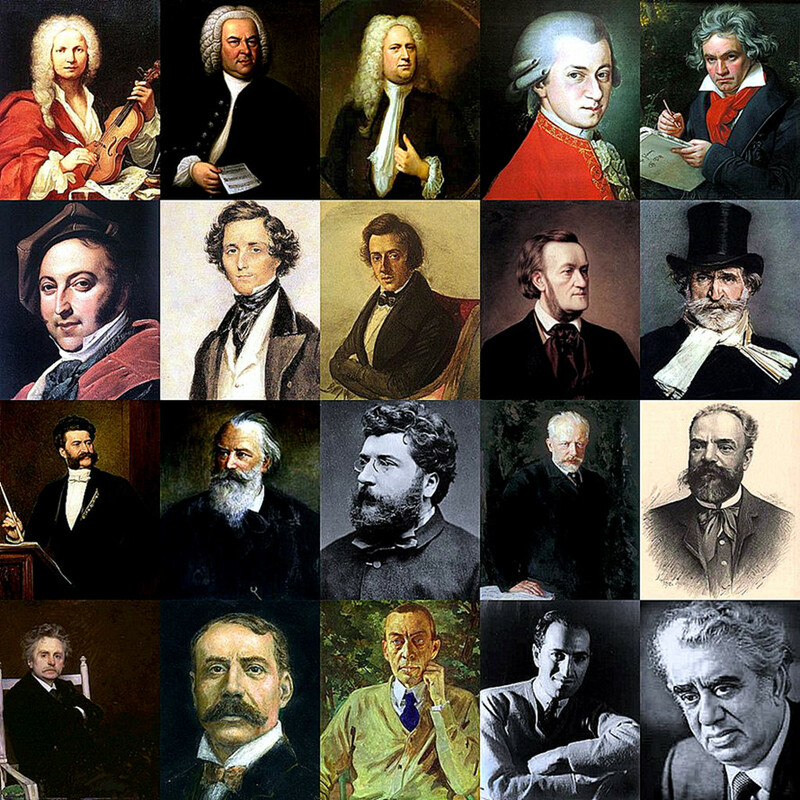 Some Classical era composers include Joseph Haydn, Wolfgang Amadeus Mozart and Ludvig van Beethoven. Subsequently, the Romantic era ushered in composers seeking to delve deeper into the expression of the spectrum of human feeling. Music of the era often drew upon European folklore and served to awaken personal and patriotic expression. Romantic era composers include Johannes Brahms, Frederic Chopin, Giacomo Puccini, Giuseppe Verdi and Peter Ilyich Tchaikovsky. 20th-century classical music ranges from modernism to expressionism to jazz-influenced compositions (1900�C2000). It marks diverse styles that are characterized by widespread experimentation in composition, instrumentation, melody and tonality. Some composers harked back to earlier periods borrowing elements and adapting them from a modern perspective. Famous 20th-century composers include Franz Strauss and Igor Fyodorovich Stravinsky. In the 21st century, contemporary classical music encompasses a varied collection of work, incorporates multiple forms of media and values the expression of the individual above adherence to any one particular school of music theory. Examples of 21st century, contemporary classical composers include Michael Nyman, composer of the musical score for Jane Campion's 1993 film The Piano.